A friend of mine on Facebook posted one of those short videos that show in quick motion the creation of a recipe. I can't figure out how to put the video on here. So I will refer you to the recipes creator and the website. I've included the recipe below. All rights are reserved for the photo and recipe with Donna Elick and her cookbook The Slow Roasted Italian copyright 2016. Bon appetite! 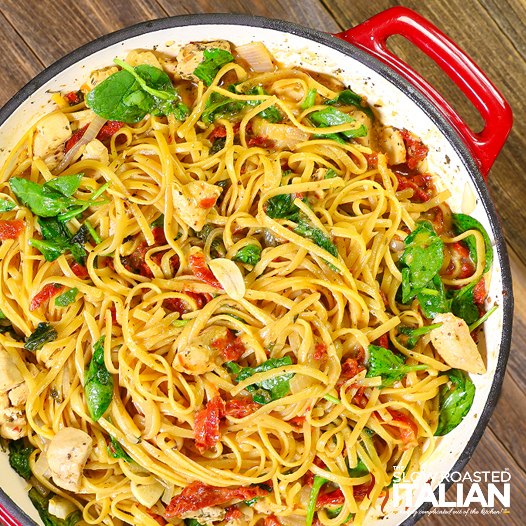 Combine 1/2 of the spinach with the tomatoes, onion, chicken, garlic, linguine, Italian seasoning, salt, pepper and crushed red pepper in a 5-quart Dutch oven over medium-high heat. Pour chicken stock and wine over top. Cover and bring to a boil. DONNA'S SIMPLE KITCHEN TIP: Dried Italian Seasoning is a fabulous convenience ingredient. If you do not keep it on hand, combine 1 teaspoon dried basil, 1 teaspoon rosemary, 1/2 teaspoon oregano and 1/2 teaspoon dried thyme. This dish is just spicy enough to make your tongue tingle. For a very mild sauce, reduce the red pepper flakes to 1/2 teaspoon. I know some people are sensitive to alcohol. The wine adds a fabulous rich buttery flavor and a bright citrusiness to the pasta. If you can use the chardonnay, I highly recommend it. However, you can substitute with chicken stock, white grape juice, or lemon water (1/2 cup fresh lemon juice and 1/2 cup water). We used boneless, skinless thighs--I do not like white meat. (I think that you might find boneless, skinless, white meat in prepared in 1/2" pieces--I was pleased that our grocery store had boneless, skinless dark meat). We should have bought the pre-chopped onions that are available in produce. It would have saved a short bit of time. I used garlic from the jar, which saved prep time. So sue me....it saved time. That was all the prep work that it took and it was very quick (like 10 minutes). My mother doesn't like heat, so I only added a dash of the red pepper flakes. This was not my preference, because I like things spicier. The jar of sun dried tomatoes weren't cut. They we're large tomatoes. I'd suggest cutting these in half before you put them in the pot. Next time I make this I'd like to try it with three cheeses sprinkled over the top for each plate. The parmesan that was in the dish was fabulous. But I love cheese. I'd like to see what those other would do. I might even try it with a little mushroom. But it is perfect as it it. This sounds delicious! The weird thing is: I don't care to cook, but I enjoy reading recipes. I have a cute term: "One pot slop", which I have preferences for because of the less cleanup, but this recipe is certainly not that. I saved this and might give it a try.